SAN FRANCISCO, Sept. 20, 2011 /PRNewswire/ — Modern Luxury, a network of luxury magazines, and GleeMaster, an exclusive, online luxury retailer, announced today that they have signed an agreement to market GleeMaster to luxury consumers in New York, Los Angeles and San Francisco. GleeMaster is committed to providing luxury merchandise – fashion, home and travel accommodation- to consumers at discounts upwards of 70%. Through this partnership, GleeMaster will have a presence in Manhattan, Angeleno and San Francisco magazines as a vehicle to reach some of the country’s most trendsetting and affluent consumers. The two companies will also partner for the GleeMaster Official San Francisco Fall/Winter 2011 Kick Off Party on November 10, at the Payne Mansion, a San Francisco historical landmark. Modern Luxury is the largest producer of local luxury magazines in the US with magazines in most of the top DMAs reaching consumers with a net worth of $1MM+. 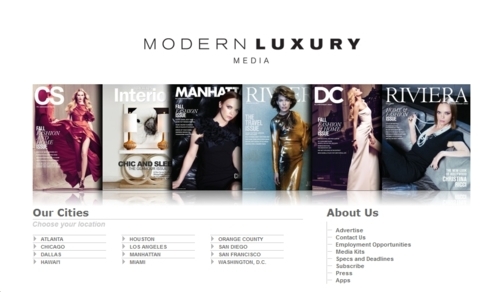 Modern Luxury publications are among the most lauded in the country. San Francisco is the 2010 National Magazine Award Winner (ASME) for General Excellence, naming it the best publication within its circulation size. Angeleno magazine is the 2010 Cordon Bleu Award winner and the 2010 James Beard Award winner for Dining Criticism. About Modern Luxury. Modern Luxury is owned by Cumulus Media and is a network of luxury magazines in the top 12 DMA catering to affluent consumers. Editorially the magazines cover topics ranging from fashion, shopping, dining, home and luxury lifestyle. About GleeMaster. Founded in 2009, GleeMaster is an exclusive member online retailer dedicated to providing luxury brands, fashion trends at wholesale prices. Membership is by invitation and there is no fee associated with joining. GleeMaster is headquartered in the Financial District of San Francisco. To find out more information, please contact Marie Grasser, Executive VP of GleeMaster at press@gleemaster.com or visit www.GleeMaster.com. SFFAMA is the largest and most innovative fashion organization in Northern California. . For any inquiries, send an email to: contact@sffamainc.org. © 2009-2012. SFFAMA, Inc. All Rights Reserved. No images located within this site may be reproduced or transmitted without permission of the copyright owner. © SFFAMA, Inc. All Rights Reserved. No images located within this site may be reproduced or transmitted without permission of the copyright owner.